It seems like it was about this time last year that this collection came out. I had gotten my own camera and was just learning how to use it. Needless to say, my pictures were horrible. This was such a good collection, it really deserves better pictures. Let's try this again. Calendar Girl. A shimmery magenta with a blue/purple flash. It has lots of little sparkles, but it's not quite as sparkly-looking as the other polishes in the collection. The blue flash is what makes this one special. Give Me A Coral Sometime. Shimmery coral. This one is actually not too different than Calendar Girl. It is lighter and has more of an orangey tint instead of pink. It also has a little bit of a blue flash. Lemonade Stand By Your Man. Shimmery lemon yellow. This one is a stunner! It's so bright and cheerful, and in the sunlight it looks like it's candy. It has so many little sparkles in it, almost like it's coated in sugar. Peach-A-Boo! 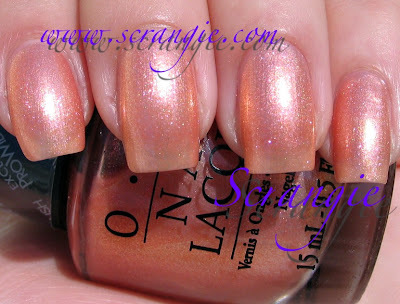 Shimmery, duochromey peach. This polish is really unique. It changes colors depending on the angle. It has a peach shimmer base, but flashes of gold, red and silver. Very, very, very pretty. Sea Ya Later, Sailor! Sheer sparkly light blue. This is a bright, beachy, watery light blue. Reminds me of swimming pools and beach balls. It's really sparkly, and one coat of it reminds me a lot of Chanel Azur. Would be great for layering. Sit Under The Apple Tree. Light golden-green shimmer. This is an unusual color. It's very light green apple green with a strong golden flash. It leans very yellow, and looks more yellow than green until you get to three coats. The formula on these is so-so. It seems like with each new collection they release, OPI adjusts the formula. They just keep getting better and better. This was pretty soon after they converted to three-free, so I don't think they had worked out all the bugs yet. These are thick but runny at the same time, what I refer to as Three Free Syndrome. They are all very sheer. These pictures are three coats. They make great layering polishes because they're basically sheer shimmers, but opacity on these is definitely buildable. I really loved this collection. The polishes are so pretty and sparkly, they look so beautiful in the bright summer sun. There was also a pretty good range of colors in this. I would have preferred a purple instead of either Calendar Girl or Give Me A Coral Sometime, but I'm still happy with the color selection. They do look very retro, and they all have cute names. 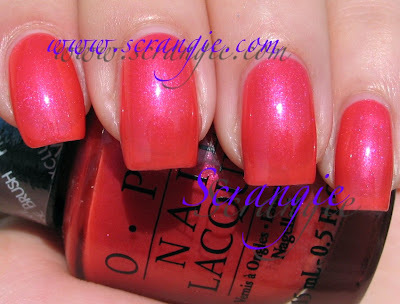 I think this was right before OPI's names started to switch from cute to confusing (Paint My Moji-toes Red, anyone?). These polishes also came with beaded hair bands around the necks of the bottles. I could never figure out how to use them. They were figure-eight shaped elastics with a bead in each loop. What are you supposed do with them? I'm sure that most of this collection is still around at the various etailers. It didn't seem to get very much hype when it was released and I never hear of anyone wearing these. Sad, because this was a really great collection and I still love it. Thanks for sharing these great pics! Calendar Girl was one that I was on the fence about, but now after seeing your pics I definitely need it!! My mom used to use those ponytails on me when I was younger. She would hold my hair in one hand and in the same hand hold one end of the ponytail. With the other hand she would wrap the other end of the elastic around my hair in a circular motion a couple of times and then put one of the ball ends through the opposite end (under the other ball). They worked great! When I started doing my own hair I could never get them to work, so I switched to plain elastics. Hope this helps! I remember those from when I was little. After wrapping the band around your ponytail you just pull the loop of one end over the ball on the other to lock it. My grandma refused to use those because she heard of it breaking and giving a little girl a head injury because of the ball and the force of the breakage. Now I'm scared of them lol! These colors are so pretty! I look twice when I see them on you. I might go buy the Under the Apple Tree now. It's one I've been eyeing up for awhile. Ok, got to comment...Scrangie, your pictures are almost always perfect! I just find it so cute that you think they aren't :). I didn't purchase any of these, but you are right they still are around. I'm on a no-buy again, and I have given away 8 polishes to a loving home. Perhaps once the July matte-period starts, I will pick some up. I may also try to find Peach-a-Boo. I kind of like sparkly peach colours. This collection is stunning! I need to get my hands on more. I love anything that reminds me of summer. I got Sit Under the Apple Tree and Peach-a-boo on clearance last year. I should have also gotten Lemonade Stand By Your Man and See Ya Later, Sailor. I regret passing them up. Peach-a-boo is so pretty, but I don't wear it often, because it is a pain to remove. Hi Scrangie! I previously has sent you an e-mail asking about nail polish colors, but I guess it dropped to your junk mailbox! I really want to get some suggestions from you. As I saw some other pictures on a Korean website, I wonder if Essie/OPI/Zoya/Orly these kind of good brands have colors like those. Since I can't upload the photos here, I will just provide you the link of that Korean online store and you can see the colors they have. Yea I know it might take a lil time to load all of them, and can you see the color no. posted next to each nail polish? Please take a look at all these and when you have time, let me know which brands carry these colors please..I really need your help and I prefer high-quality nail polishes :) Thanks, I will come back and check for your reply LOL. Your comment about the hair tie cracked me up! I can't figure those out either. See Ya Later Sailor looks so pretty! Hey Scrangie, it's me again! I found some colors which might be the substitutes, will any one of these look similar to the #PE02? Moreover, I bought Essie's Perky Purple earlier but I found it looks more like fushia sometimes under bright light. But I really like the neon nail polishes, I am trying to find another Neon purple. Will the followings look more purple instead of fushia? Thanks for sharing these lot of pics! Got a new fav - love the color Sit Under The Apple Tree. I've got See ya Later, Sailor and Sit Under the Apple Tree. I struggled with building the oapcity so layered them over white and they looked brilliant - love this collection. I have wanted Lemonade Stand by your Man and Peach a Boo since last summer, I think you just convinced me to get them! Hi Scrangie! Wonderful pics as usual. I think Calendar Girl was the only OPI I purchased a bu of in 2008. Love this shade for notd or potd.!! I've seen some pics of these but they haven't really done them justice, your pics have me lemming them all! I think my favourites are Sea ya later sailor and sit under the apple tree. I never used to wear blues and greens and swear it's your beautiful pics that have got me loving them now. I'm really looking forward to the sunbelievable colletion, I want banana bandana it would be my first ever yellow. However, I must wait for your pics, then I'll be able to decide whether I really like it not! (coralfriend?) I really like peach-a-boo. I think I'll track it down, somewhere. I just bought Sea Ya Later Sailor from ebay and can't wait to get it! It looks so pretty. Your pics are great, I love them. These all look stunning on you. I think if you painted your nails with bird doo I would have to buy it. Your photos are of excellent quality. Thank you. As a long time hater of yellow polish, I think that this one 'Lemon-Aid Stand By Your Man' is very appealing, the shimmer and tone of it is eye-catching. All your polish pictures are great!! I too remember those hairties from when I was little. I really like Lemonade Stand By Your Man. I just ran into Sea Ya Later Sailor on a CVS little stand. I snapped it up. They had this yellow too but I did not think I would pull it off well. I like Lighthouse from China Glaze in this kind of yellow and that's all I need. By default someone sent me Callendar Girl by mistake and told me to keep it. Not a big fan of CG but loving Sea Ya Later Sailor. I use SYLS -get this - over some of the pinky/red glass fleck and other red range glass flecked Zoyas. I end up with this amazing duochrome look. Blew my mind to see that effect come up.